As you’ll read time and time again here in the various lessons at Guitar Noise, you may not need to know any music theory to be a guitarist, but even knowing one or two little things will help you and your playing improve immensely. Simply being aware of the “root note” of any given chord, for example, can make your playing a lot less muddy. Plus, it will give you a head start when it comes to identifying and playing those mysterious chords like “C/B” or Em/C#,” which are known as “slash chords. Play either of these chords first by strumming all six strings, and listen closely to the chord as you do so. Take a pause and then strum the chord again, this time beginning your strum on the A string and not hitting the open low E string. Compare each of these ways of playing the chord (don’t hesitate to repeat each way) and listen to which method gives the chord a cleaner, crisper sound. Chances are you’re likely to pick the five-string strumming version of the A or Am chord over the full six-string strum. Now let’s take a moment to examine why. If you think about either of these chords, you might wonder why there is a difference between playing them with five or six strings. After all, the E note is a component of both the A and Am chords (as evidenced by both using the E note of the open high E string, not to mention the E note at the second fret of the D string). But playing the open low E string does, indeed, muddy up the sound of the chord. More often than not, when we strum a chord on the guitar, we try to use the chord’s root note as the lowest note we play. Simply put, the root note of any chord is the note that shares the note name of the chord. The root note of A is A. Likewise the root note of Am is A. The root note of E or Em is E. No matter how complicated the chord, figuring out the root note is easy. The root note of G7 is G. The root note of C7(#9) is C. The root note of F#m is F# (not F). On the guitar, where the less than an octave separates the three lowest strings, it’s easy to muddy up the sound of the chord. Using the chord’s root note gives the chord a strong foundation on which to sound. This is why in most chord charts, such as the two you’ve seen so far, there will be an “X” over the low E string, indicating that you should not play it when you strum the chord. The regular open position C chord is another good example of this. Play a C chord with all six strings and the open low E string will make the chord sound garbled. Begin your strum on the A string (where your finger is on the C note at the third fret) and the chord sounds clean and clear. But while having the root note as your lowest note of the chord on the guitar is often desirable, it’s certainly not the only possibility. You can use the fifth of a chord to create an “alternating bass line” as in our “Margaritaville” lesson where the bass note of the D chord alternates between D (the open D string) and A (the open A string) while the bass note of the A (or A7) chord alternated between A (the open A string) and E (the open low E string). And sometimes you just want a note other than the root note to be in the bass. This is where slash chords come in. Em/D is perhaps one of the easiest chords a guitarist can learn. You simply strum the open four highest strings – D, G, B and the high E. Playing an Em/D chord is often a great time to wave to someone in the audience! And you can also employ slash chords to use a single note in the bass to drive the song forward. The above examples are chords you’ll find in songs like Pete Townshend’s “The Punk Vs. The Godfather” (the A, D and F chords, all with A in the bass) or “I Can See For Miles” (the second line of chords). 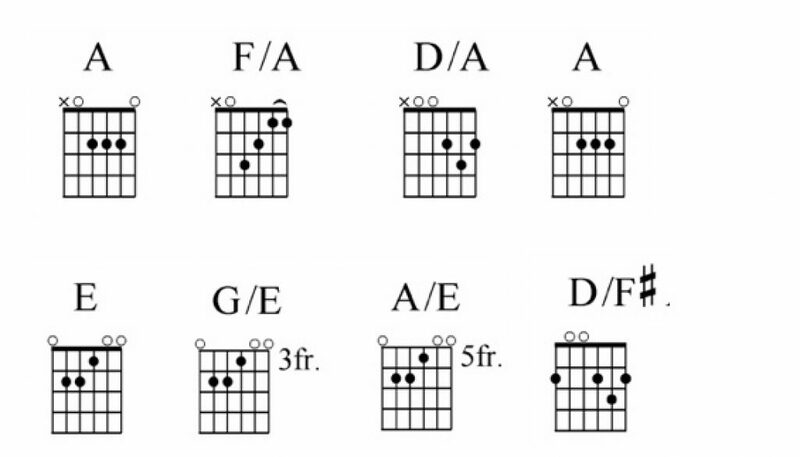 And this is a good place to point out that, technically, we should probably call the G/E chord in that second line “G6/E” since the high E string is also open. Likewise one might certainly call the A/E chord in that example “Aadd9/E” because of the open B string. Slash chords can be tricky things because it’s easy to want to overanalyze them. Most musicians, guitarists or not, will see a chord progression such as the C to Am that we started with (or the C to G to Am) and automatically use slash chords to create the connecting bass lines without thinking twice about it. Ideally, you want to get to the point where you have that mindset as well. If so, take a few moments to go over some of our “Connecting the Dots” lessons that deal with walking bass lines. One final observation – if you’re playing with a bass player, than usually he or she will pick up the new bass note of the slash chord. Although you certainly can still play it if you’d like to do so. Doesn’t hurt to get in the practice! Why are all the “C” chords wrong (they’re all C/B) in the C to A bass line progression? My fault, I’m afraid. I didn’t do a good job proofing the charts. Should be fixed very soon. Thanks for your patience. You may want to look at the D – D/C# – D/C progression’s charts as well. They all appear to be D/C. Those should be fixed soon as well. Apparently the software that I used to create these chord charts automatically locks itself into “chord families” and even though I was seeing the correct versions in my original manuscript, the moment I exported it for publication they switched to what you have seen. Fortunately I’ve managed (I hope!) to sort it all out. Although (unfortunately) it took the better part of the last three days to do so! Thank you (and all of our readers) for your patience in this matter. Looking forward to chatting again.